Home > Bullying In Schools > What is Cyber Bullying? It is amazing to learn that so many parents are unaware of a new style of bullying our children at school that draws upon the advances in modern technology as a means of doing so. This particular method of bullying is referred to as ‘Cyber Bullying’ and has now become almost as unpleasant a method of bullying as verbal or physical abuse. To give you an idea as to how ‘Cyber Bullying’ works, and what it actually is, we first of all have to discuss the nature of your child having a mobile telephone at school. 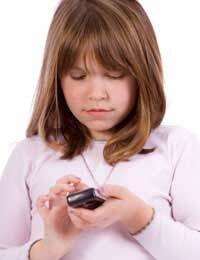 In this day and age most of our children – some as young as six or seven – carry mobile telephones as a means of communicating with us as parents and keeping a check on their whereabouts. This of course is a valid use of a mobile telephone and although most schools would agree with it in principle it has now become regarded as another thorn in the side of those wanting to tackle the problem of bullying in our schools. In a report produced by the Anti-Bullying Alliance by the University of London, the number of instances of ‘Cyber Bullying’ has vastly increased in the last few years. This is mainly because of the advances in modern technology and also because of the drop in price of said technologies, which make it more accessible to those who might not have previously been able to afford it. Text Messages: Text messages sent to an individual or group of individuals using threatening statements and foul language in order to provoke fear in the recipient. Picture Messages: Used to make the recipient feel threatened using images that may cause fear or embarrassment and can be sent to numerous recipients. This has led to a bullying culture known as ‘Happy Slapping’ whereby the bully will attack the person being bullied and then share the footage of it with others. Phone Call Bullying: which as the name suggests is a method of bullying by calling a person and telling them of your intent to hurt them or cause them actual bodily harm. It can also be simply telephoning the person being bullied repeatedly without speaking. Instant Message (IM) Bullying: This is where a person being bullied may receive messages in real-time using an Instant Messaging program that allows your child to conduct conversations with friends over the Internet. Indeed there are many ways in which ‘Cyber Bullying’ can manifest itself but those listed above are by far the most commonly used. It has been reported that ‘Cyber Bullying’ can have just as much of a devastating effect on your child and their behaviour than if they were being physically attacked by a bully or verbally abused in person. It is also the case that the bully has more deniability using these methods of bullying than if they did carry out a personal verbal or physical attack on your child. ‘Cyber Bullying’ limits greatly the chances of the bully being seen carrying out the act of bullying. Most schools now in the United Kingdom operate an Anti-Bullying policy, which includes dealing with ‘Cyber Bullying’ and as such it is worth while discussing this with your child’s school should you think there might be evidence of it taking place.